If you are contemplating an upgrade to your audio system, you may want to consider the addition of subwoofers. Not only can subwoofers extend the bass response of your system, but they also may lower distortion as well, by reducing the acoustic demands on your main speakers. Soundstage rendition might also be improved by the additional low frequency localization cues stereo subwoofers may provide. In this brief article, we will explore both the advantages and disadvantages of adding a subwoofer to your system. The most difficult range of the frequency spectrum for a loudspeaker to reproduce is the bass. To create sound, the speakers must move air. Powerful and extended bass reproduction requires moving a lot of air, and that is an expensive proposal. Consequently this is the area most often sacrificed in the fight to maintain a price point. 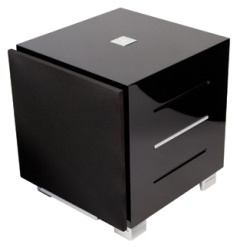 Large drivers and physically imposing enclosures are requisite if we seek extended low-end. Most all moderately sized dynamic speakers (and virtually all planar designs) suffer from the lack of true bass extension. It is very difficult and expensive to design a really good full-range system with state of the art bass reproduction. Many listeners feel that only a handful of extremely expensive, monolithic speakers are capable of truly full-range performance, doing justice to the bottom octave of reproduced music. 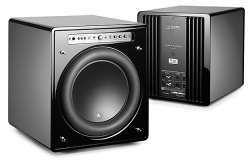 To achieve truly extended low bass response with most speakers requires the addition a good subwoofer system. For those reasons, subwoofers have become commonplace. In many ways, it makes good sense to purposely design a speaker to reproduce only the bass range. You can use a large (or multiple smaller) drivers, an enclosure not limited by size or layout and the ability to add a dedicated, high-power amplifier. In my opinion, significant improvements in the art of subwoofer design have been achieved in recent years. In times past, subwoofers were slow, slovenly beasts that were hard to control and even harder to integrate into an audio system, especially those systems employing faster planar speakers. The arrival of new designs employing advanced electronic servo-control and dedicated amplification, has led to a real revolution in subwoofer design. Consequently quality has improved immensely. Several manufacturers compete in this arena, offering superb products reflecting a wide range of prices. Beyond the obvious benefit - more bass - subwoofers can contribute to a systems performance in a variety of ways. First, by relieving the full-range speakers from the arduous task of attempting reproduction of extreme low frequency material, they are free to perform in a more comfortable frequency range. This "lightening of the load" improves performance of the full-range speaker (especially planar designs) by reducing distortion. The distortion is caused by the large cone/diaphragm excursions associated with low frequency reproduction. Additionally, one may find that more choices in amplifiers are now suitable for use in the system, due to reduced power demands. When setting up speakers, you’ve likely noticed that the ideal location for soundstage/tonality, is not the best position for bass. The position we ultimately choose is usually a compromise. With separate main speakers and subwoofers, we have the freedom to locate each in a more ideal position, using the room to our advantage, especially in the case of the subwoofers where room boundary effects can be used to our benefit. Lest y ou be swayed too easily by the foregoing comments, let me assure you that all is not roses in the land of subwoofers. Ultimately, there are tradeoffs. The addition of subwoofers complicates the system, adding extra boxes, cables, etc. More space in the room will be consumed by the extra enclosure, and you may not have room. Most subwoofers systems will introduce additional circuitry into the signal chain. A crossover is required to split the full range signal into low pass (sent to the subwoofer) and high pass (sent to the main speakers). There will certainly be some degradation to the signal, and this loss is audible. Is the trade-off worthwhile? This, added to the concern of insuring an adequate match between satellite and subwoofer gives us pause, and should lead us to a carefully considered decision. First, determine your feelings toward your current speakers. If you really like your present speakers, but find them severely lacking in the bass, you may very well be a candidate for subwoofers. If you are not overly enamored with your present speakers, then think of purchasing new, larger speakers to satisfy your desire for more bass. You may be able to improve the overall quality at the same time, and for a cost at or below what it would cost to add subs.